Solar Team Eindhoven's cruiser class "Stella" car is seen in competition on Sunday, October 6, 2013. 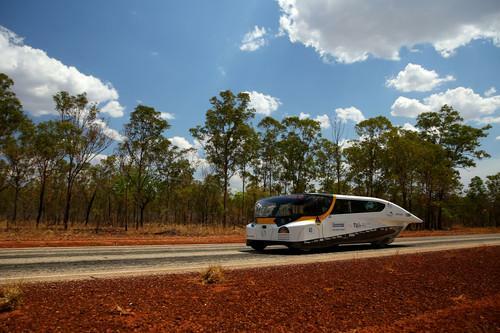 A solar-powered car carrying four people hit speeds of 120 kilometers per hour (75 miles per hour) as it raced across the Australian desert in this year's World Solar Challenge. The car, called Stella, was built by the Eindhoven University of Technology and is currently leading the cruiser class of the biennial solar car endurance race. The cruisers are a newly added class or car intended to carry more than one person and be more practical than the typical sleek, slim and single-person vehicles that compete in the race. At the end of day three of racing, Stella leads three competitors in the class. The University of New South Wales is 17 minutes behind in second place, up one place from Monday, followed by the Hochschule Bochum Solar Car Team a further 12 minutes back. The University of Minnesota's Solar Vehicle Project is in fourth place almost four hours behind the leader. Possibly out of the race is Kaiton II, the product of three years work by students at Japan's Goko High School. The car lost its rear wheels just outside of Alice Springs on Tuesday afternoon and the team will only get further with major repairs. In the challenger class, that pits those slim and sleek single-seaters against each other, the lead remains with the Nuon Solar Car Team from Delft University in the Netherlands. At the Kulgera control point, 1,766 kilometers into the roughly 3,000-kilometer race, the car is 20 minutes ahead of Japan's Tokai University. Competition is fierce between the two as Delft University won the World Solar Challenge in 2001, 2003, 2005, and 2007, and then lost the crown to Tokai University in 2009 and 2011. Third place is still held by Solar Team Twente from The Netherlands, which is just over an hour behind Tokai, followed by Stanford University's Solar Car Project, which is a further 45 minutes behind. With just over half of the race complete for the challenger class cars, there's still a lot that can happen. Turkey's Istanbul Technical University found that out on Tuesday when its main support car caught fire near Ti-Tree. Team members are safe, but to continue in the race they have to figure out a replacement team car within the allotted time.